I like this one! It's featured on wikipedia, right? You're the master of stereograms! That's a good one to get people used to how Magic Eyes work! You really are a magician! Hi, great stuff. Could you give me a good link on how to make stereograms. Thank you for the reply. I found link to your freeware program and it works great. One question how did you do the chess stereogram. I like the idea of seeing the original image but geing stereogram. So it's not like any "image" could be done with this technique? What i'm aiming at is i want to turn my images into stereograms withouth distorting the image. 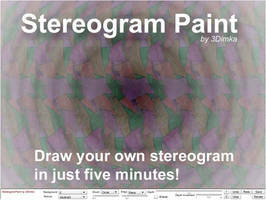 The way stereogram works is based on repetitive pattern. Scale and shift difference between two patterns create change of hidden depth. Thank you for the scoop. I have always loved stereogram and I've looked at hundreds of them, but this is really one of the best ones I've ever seen before. Very nice! It must have been pretty hard to make. I mean, I already took so long making a sphere on 3ds......Great one! thank you, this one is definitely not the best one, it's the shadows what makes it looking good. Just wanted to let you know, but maybe you already do. Oh great, Fred have used an image I submitted in 2006! cool. 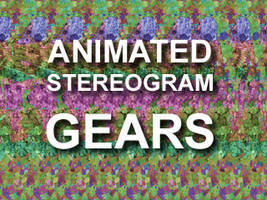 why do you have so many seemingly good stereograms in your scraps? Looking at yours newer works I just thought: is it possible to create a stereogram based on real picture instead of repeated pattern. And here it is! thanks for comments and featuring, Artur, I appreciate it. Well, this one is solid array stereogram and it's not difficult to render at all. WOW THAT'S CRAZY! I have never seen a stereogram with so many levels going back. usually it's about two objects, one behind the other, but this is pro. that website is pretty cool. I have spent hours on it before. you may want to join 3D-Stereograms group as well- [link] , Gene sometimes posts his new works there. the fields in the background are too big i think. they should be smaler then the ones in the foreground for a realistic perspective. but it is still very impressive. awesome, but really is some one winning here??? Cross-eyed stereograms qiute rare, so I don't publish them here, at dA. Whee! The effect is really awesome! Wow...that's awesome! 3D is so kewl. ^^ I've only worked with Bryce, but I'm learning 3dMax next year.